Happenstance creates a series of inter and un-connected performances based around the surrealist parlour game (exquisite corpse), using ‘cut up’ techniques. With improvised and electr0-acoustic music by Galvanize ensemble, with other music/installation by Tansy Davies, Helen Papaioannou, Robert Szymanek (LSO Soundhub composers’ scheme), Paul Fretwell, Laurie Anderson, John Cage, Christian Wolff, Stockhausen, Ryoko Akama (Huddersfield University). The ensemble is joined by emerging fine artist, Claire Orme, who creates site- specific performance ‘live art’ pieces, as part of the project. Commissions for the project are by Manchester based sound artist Angie Atmadjaja and composer Edward Jessen’s MAIDEN NAME. 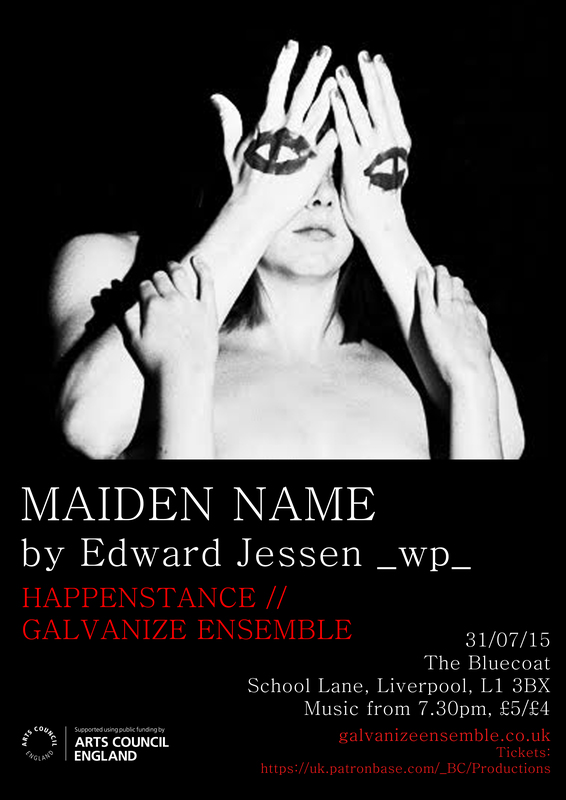 Galvanize ensemble is an improvisation ensemble and cross-media art group, led by Kate Halsall. Players are Joel Bell electric guitar, Sarah Dacey soprano, Kate Halsall piano-harmonium, Paul Fretwell electronics, Phil Maguire objects, Genevieve Wilkins percussion. Guest performers have included Jennifer Allum violin, Aisha Orazbayeva violin, Stephen Hiscock percussion, Serge Vuille percussion, Donna Lennard soprano, Marjolaine Charbin piano, fine artist Claire Orme. 7th- Composers’ Workshop with Galvanize Ensemble, students from MidKent College and School of Music and Fine Art [University of Kent]. There is the rare occurrence of the expected. And in this case . . . it comes in the form of a moment. A moment, brief by human standards. It is a cheer that consists of eight syllables . . . three of them a name. And it goes, Bah bah-bah! Bah bah bah . . . bah-bah! Here . . . to succinctly depict a dramatic physical moment is the story. An elaborate process. From the ground up. It is there to engross you in its ocean of detail. The detail, the immensity of the detail, the force of the detail, the weight of the detail—the rich endlessness of detail surrounding you. It is in the form of the greatest moment. And the telling of it is going to relieve you. It is going to relieve us all.